Seaberry designs reports, a lot of them. The purpose of these reports is often to explain the history of an organization or the effect of some important development on people's lives. Explaining those events means providing some historical context, and that context often requires a timeline. Historically the timeline is among the most revered of visual calendar arts, dating back to before the common era (BCE). Parian Marble (264 BCE) and A New Chart of History from Joseph Priestly’s A Chart of Biographies (1765) are among early timelines that illustrate the importance of the art in the modern era. The oldest surviving Greek timeline, the Parian Marble (264 BCE), traced the central events in history since the accession of King Cecrops in Athens (1581 BCE) to the fall of Troy (between 1260 and 1240 BCE). From the Renaissance in Europe (14th - 17th century) to the classical period (1750 - 1820), the art of “chronology” held a status higher than history itself. 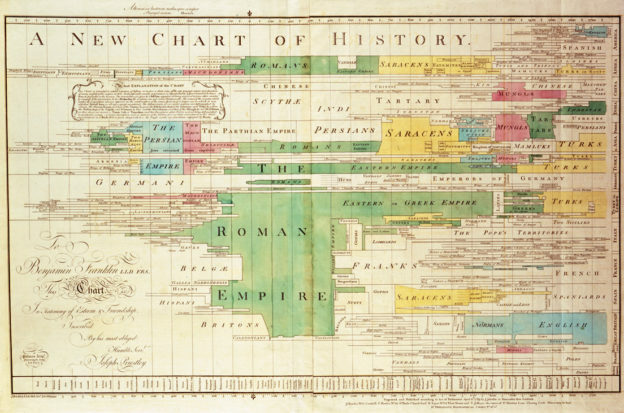 Joseph Priestly’s A Chart of Biographies, published in 1765, contained the precursors to the modern timeline including the hand-colored A New Chart of History. The modern timeline has become indispensable as a tool for expressing important dates and events as well as illustrating the impact of those events on people’s lives. Illustrating events using timelines establishes a framework that provides an objective and stable view of how those events relate to each other over time. Timelines can be used to illustrate the evolution of company products and processes or in the case of a recent Seaberry project to establish the history of antimicrobial resistance. Timelines can also be combined with geography to illustrate the speed of worldwide deployment or the movement of resources from one location to another locally. The applications are almost endless. Time and time again, so to speak, timelines have proved to be a designer’s best friend. This entry was posted in Blogazine and tagged report graphics on January 20, 2018 by Cherisse Lu.